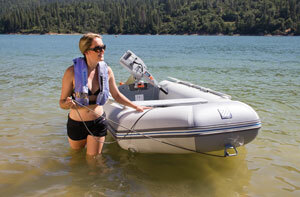 The AL-390 is big and roomy for a dinghy, with a durable aluminum floor. Our customers have given the AL-Series boats great reviews on this site. West Marine constantly strives to improve our selection of affordable inflatable boats, and we’re justifiably proud of our fleet. Our boats combine progressive technical features, rugged durability and great design, so you can be confident of superior value. West Marine inflatables are created by world-class naval architects like Henning Neumann, who has designed many of our boats since 1990. He’s also drawn boats for Avon, Metzeler and several top manufacturers during his career of over 50 years. An inflatable’s floor construction is the key to the trade-off between portability—ease of assembly and compact storage—and the rigidity needed for best performance. A rigid deep-V hull made from composite plastic, fiberglass or aluminum—a Rigid Inflatable Boat—is an efficient high-performance planing hull, but RIBs often must be stored on a trailer or set of hanging davits. Boats with more flexible fabric floors fold to a light, compact shape, but their flexibility exacts a performance penalty. If you want your boat to plane, allowing you to exceed five miles per hour, a semi-rigid floor is required. Which matters more to you, performance or portability? Like dinghies, these boats have floors you don’t have to remove when stowing the boat. Roll-ups like our PRU-3 can be unrolled, inflated and launched in minutes. Floors use wooden slats enclosed in fabric pockets, and you don’t need to remove them for storage. Roll-up boats have a transom, so you can use a small outboard motor. Roll-ups excel as tenders. Their flat bottoms and small engines make their performance non-planing, limiting their range to in-harbor, relatively flat-water travel. Sport boats are inflatables with a removable rigid floor system made from plywood, composite plastic or aluminum. The floor assembly is made stiffer with the addition of stringers, which run fore and aft to hold the floorboards in alignment, and aluminum extrusions to hold the edges in position. With the floorboards assembled and the port and starboard hull chambers and small tapered keel tube inflated, the boat’s floor fabric is stretched taut and takes on a shallow V-shape. This enables the boat to ride through chop and track in turns better than a flat-bottomed boat. The floor also makes sport boats heavier than dinghies, but these boats are fast and lively with outboards from 6–25hp and offer a great performance for the price. Take a sportboat, such as the PSB-275, and trade the wood floor for a high-pressure inflatable floor, and you have an HP Inflatable Floor boat (sometimes called an Airfloor boat), combining the performance of a sport boat with the light weight and compact stowage of a soft stern dinghy. Its special high-pressure inflatable floor (pumped up to 11psi) is substantially lighter than floorboards and, when deflated, can be rolled up right inside the boat. Inflatable floor boats jump on plane quickly and achieve fine performance using only a small outboard, thanks to their low weight. Our 73lb. PHP-310 will plane with one person using only a 5hp outboard. The boats flex just enough to absorb wakes and waves that would threaten to throw you out of a hard-bottomed boat. HP floor boats are a brilliant combination of benefits, not a compromise. And the setup time is very short! RIBs offer the “real boat” performance and strength of a rigid moderate- or deep-vee hull. Their fiberglass hulls carve turns and cut through chop like conventional boats and shrug off abrasion from cruising gear, sand and gravel, dive tanks, etc. But unlike conventional boats, the addition of inflatable tubes to the topsides makes them more stable, more buoyant and less likely to scar the topsides of other vessels when used as a tender. Their lack of portability is the price you pay for a RIB’s performance. The hulls cannot be disassembled, and therefore you can’t stow your RIB in a bag in the lazarette. You can deflate the tubes and stow the boat on deck in far less room than the inflated boat, but it still takes up space. Therefore, we generally recommend RIBs for owners who either intend to stow their dinghies inflated on deck, on davits, or deflated and lashed on a weather deck. Their light weight also makes them a cinch to trailer on a light-duty boat trailer. Cruisers who are headed for the tropics may be interested in our new aluminum hull RIB. It has the most rugged hull available, so it’s perfect for hauling up onto a rocky beach, and it has Hypalon fabric, for UV protection. See our video below. Compact RIBs have a hinged folding transom, which allows the boat to be stored in much less space, and are super portable - we’re talking roof rack to water in just 10 minutes! The hull is made from fiberglass and has a shallow V-shape. The transom is a plywood sandwich that is firmly bonded to the inflation tubes. A flexible fabric hinge connects the floor to the transom, allowing the transom to fold flat when stored. A large zippered bag is included for storage, and the stowed boat looks like a giant surfboard in a travel bag. 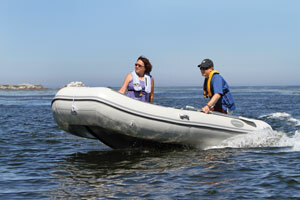 While still large, the Compact RIB will fit on a foredeck or under a boom much more compactly than a normal RIB. It also fits nicely on vehicle roof racks or in the back of a station wagon. Are you planning to use this boat in the tropics? The location where you intend to use your boat is the key factor in deciding which hull fabric, PVC-coated polyurethane cloth or Hypalon (neoprene-coated nylon). Both fabrics are rugged and dependable, but if you will do most of your boating in tropical conditions, a Hypalon boat will last longer because of its better resistance to UV degradation. Our Hypalon boats are made of Pennel Et FLippo Orca 215 Hypalon fabric. We purchased a multi-year supply of this material, as the new replacement CSM fabric used by other boat manufacturers does not hold up in extended UV tests and will not last as long. This is another reason why purchasing a West Marine boat is a great value. When inflated, the best protection against damaging exposure is a quality fitted cover. In addition to blocking UV radiation, covers such as our marine polyester Inflatable Boat Covers also protect your boat from accumulated dirt, bird droppings and standing water. 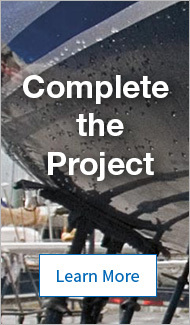 Their modest cost is rapidly repaid by extending the life and the increased resale value of your boat. Specially-formulated inflatable boat cleaners and protectants, like our Two-Part Inflatable Boat Cleaner & Protectant, and comparable products from MDR and Star brite, make it much easier to maintain your boat in “like new” condition by removing dirt and salt and leaving a gloss on the fabric. How big of a boat will fit your needs, space and budget? Buy a Reasonably Sized Boat! There is a good reason we make this recommendation, which may seem self-serving. Bigger inflatables handle dramatically better than smaller ones. The differences between an 8'6" sport boat and a 10' sport boat in handling, carrying capacity and ride, due to the small surface area of the small boat hulls, are greater than you can imagine until you actually try them side-by-side. A sport boat less than 9' long is capable of planing, but tends to be squirrelly on the water, and will fall off a plane easily. 10' boats (and especially 11' boats) have less bow rise when they accelerate and will stay on plane at lower speeds. They are less sensitive to steering inputs so you can relax more while driving them and their larger tubes with slightly greater freeboard will give you a drier ride. Longer boats also have more usable interior volume. Outstanding warranties: West Marine boats have a five-year air-holding warranty on hull construction and a one-year warranty on parts and accessories. Our PRU-3 is a flat-bottom dinghy that stows compactly without the hassle of removing a floor. Best for around-the-harbor transit, since it doesn’t plane. The short-shaft Torqeedo 1003 electric outboard (shown in the picture) is a great companion to this dinghy. Accessories, valves and hardware: Each of our manufacturers fits excellent accessories like stainless steel towing eyes, strong aluminum oars, reliable inflation valves and heavy-duty pumps to help you inflate your boat quickly with minimal effort. Communication equipment: handheld VHF. Models that include a GPS receiver, like our VHF470B, also function as a distress beacon with Digital Selective Calling. Oars or paddles, engine spares including spark plugs and a spark plug wrench, basic tools, a small anchor and 200' of small line, and of course life jackets for everyone onboard.